I Am Part Of The WordPress Family! 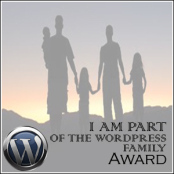 This is an award for everyone who is part of the “WordPress Family”. This is for anyone who has taken you in, showed you some love or just generally affected your WordPress experience in some positive way. You will likely never meet these people, but they are there for you like family. I love the idea of this award! What a lovely way to spread the love around WordPress. I’m so honoured to have been accepted into the WordPress fold! Visit and thank the blogger who nominated you and link him/her to your blog. Nominate 10 other bloggers you see as having an impact on your WordPress experience. And of course, let them know! Copy and paste the award logo on your blog. 1) What is the meaning of life? Nice and easy starter question (: The Scientist in me makes me say that the meaning of life is procreation. However the Artist half of me believes that the meaning of life is to help or improve someone, something, somewhere on this Earth, and leave the world a little better than how you found it. 2) What is happiness all about? For me, happiness means no regrets. Life may not turn out the way you planned, but dwelling on “what might have been” won’t get you anywhere. Happiness is forgiving yourself for your mistakes, and facing the present and future with an open heart and mind. 3) Why did you start your blog? Lately, my personal philosophy has included pushing my limits and challenging myself to do things that would scare the “old me”. The idea of laying myself bare, offering up my thoughts and opinions for anyone to read or critique, terrified me. So of course, I had to do it! 4) What is more important in your life: relationships or fame? Here’s a great quote for that: “Fame is a bee / It has a song / It has a sting / Ah, too, it has a wing.” (Emily Dickinson) Fame is fleeting, but if you do it right the relationships you build for yourself could last a lifetime. 5) What is the one thing you like about blogging? Honestly, I love the way that blogging allows you to connect with total strangers. I’m still not sure how anybody has actually managed to even find my blog, but when I log in to start a post and find out that somebody halfway around the world thinks that I have something interesting to say, I feel like I’m walking on sunshine. 6) What is the best decision you ever made? The first thing I thought of was my decision to work with a career counsellor last fall. With his guidance, I went from feeling completely overwhelmed and clueless about my future to having a clear direction in mind and a promising future ahead of me. Best thing I ever did. 7) Do you believe that unconditional love really exists in any kind of relationship? Before a rough break-up a couple of years ago, I was doe-eyed and naive enough to think that if you loved someone enough it would always endure. Now I think that as far as lovers and friends go, love is extremely conditional. But then there are my parents; we fight, of course, and sometimes it gets ugly, but I can’t see that there’s ever anything that I or they might do that could destroy what we have. 8) Do you believe in Karma? If yes, then what are the good and bad Karma according to you? I have a bit of a tough time answering this, actually. As an atheist, I simply can’t subscribe to the idea of some cosmic power punishing or rewarding people for their actions. On the other hand, I really do believe that good things generally happen to good and decent people, while dishonest people attract more negativity with their misdeeds. For me, this is Karma. 9) Do you believe in rebirth or afterlife? If yes, then why? I used to when I was in my teens, but not anymore. I have a soft spot for ghost hunting shows, but purely for the entertainment of watching them freak themselves out. I believe that when you die, you die, and that honestly doesn’t scare me. In fact, it makes me want to do things like challenge myself to try new things because for me, this life is all I have. 10) What is the best moment of your life? The best moment of my life would probably have to be the month that I lived in France during my undergrad degree. I actually feel like I grew up a lot during this trip because I had to navigate a foreign country all by myself, and be independent and resourceful in a way that was new to me at the time. It was exciting, and wonderful and perfect! These are some of the blogs that have impacted my WordPress experience, in one way or another. Thank you for being amazing! 4) Mike is happy. Relatively. 5) Writings of a Mrs.
6) Is This Thing On? Awesome!! Thank you I’m going to work on my post! Those are some wonderful answers! I especially love how you countered question number four with a quote by Emily Dickinson!